SKU: 1244-015152. Category: Underfloor Heating Thermostats. 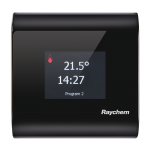 The NRG-DM can be used with all Raychem underfloor heating: T2QuickNet ,T2Red, T2Red Mat, T2Blue, T2Blue Mat & CERAPRO . 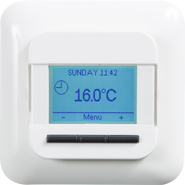 This model of the NRG thermostat family is intuitive and easy to use or program. Compatible with floor sensor of 2k?, 10k?, 12k?, 15k? and 33k?